By the turn of the 20th-century the business leaders of Brantford had transformed the City into an industrial powerhouse. As the 19th-century came to a close Brantford was number three in Canada in manufacturing output exported, surpassed only by Montreal and Toronto. The earliest manufacturing industry in what is now Brantford was shoemaking. Arunah Huntington and W.D. Dutton both started their shoemaking businesses in 1819. The population of the City in 1901 was 16,685. Brantford was the thirteenth largest city in the country. A number of factors contributed to Brantford’s rise to industrial prominence. For reasons not clearly understood, every era develops hot spots for entrepreneurs, e.g. Silicon Valley. During the 19th-century as the industrial revolution took hold in North America, Brantford was an entrepreneurial magnet. When new technologies are introduced, barriers to entry are low and anyone with an idea and some money can start a business to exploit the technology. Many of these ‘idea’ people landed in Brantford. Transportation. Brantford was a quiet inland village that was arduous to reach by road, so trade was local. Ambitious and driven people recognised that the Grand River could be made into a waterway to provide cheap and easy access to the Grand Lakes and the Erie Canal. Brantford thus became an important grain and farm produce distribution centre. The commerce that the canal created led to the early building of the railway to Brantford, a more reliable method of transportation that operated year round. Brantford no longer was constrained by poor road transportation. Capital. Many of the businesses that started or moved to Brantford were able to secure financing locally. The merchant class, established in the early days of the village, created a pool of locally available capital. These capitalists, today we call them venture capitalists, wanted the town to grow. Growth was good for their businesses. The returns on providing financing were also lucrative to the financiers. This class was led by Ignatius Cockshutt. City Council. The City Council was populated with successful businessmen. As a consequence, the Council took an aggressive stance in encouraging new industries to establish operations in Brantford through preferential tax treatment and bonuses paid to companies to locate here. Marketing. Marketing in the 19th-century was accomplished by demonstrating the prosperity of the community. Public buildings were elegant and substantial, e.g. the County Courthouse. City services were also developed: fire protection, street cars, library, water works, gas works, electricity, and a hospital. Brantford had everything you would expect in the old country or large North American cities. In 1901 there were 45 manufacturing businesses in the City. Farm implements and machinery factories were the largest employers but there were also woodworking factories, foundries, woollen and cotton mills, pickle and biscuit factories, binder twine makers, carriage builders, distillers and vintners, saddlers, flouring mills, and packing houses. Farm implements output represented about a third of all industrial shipments. Railways were the drivers of the industrial revolution, helping to get manufactured goods to market. Three railways served the City, the Grand Trunk Railway (1854), with direct connections to Buffalo via the International Railway Bridge, the Toronto, Hamilton, & Buffalo Railway (1894), with its connection to the Michigan Central Railway system at Waterford, and the Lake Erie & Northern Railway (1916) connecting Brantford to Port Dover and the Canadian Pacific Railway mainline in Galt. 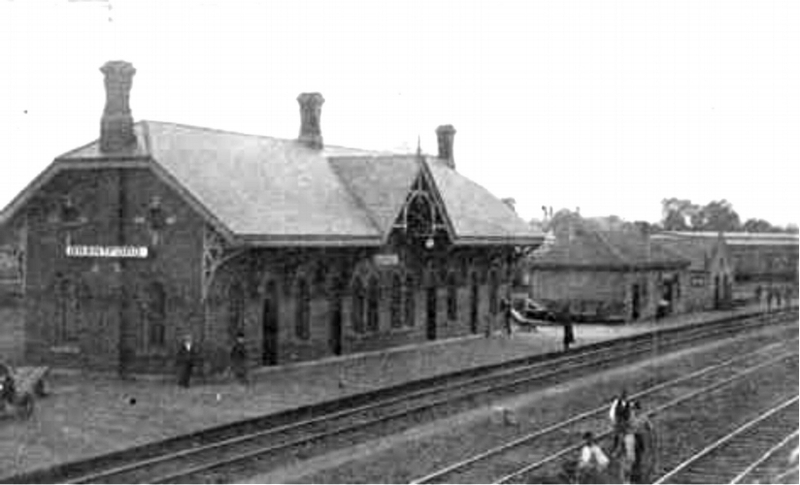 In 1905 the Grand Truck Railway diverted its main line to run through Brantford, rather than Harrisburg, and built a new train station that operates to this day. An electric radial railway line to Hamilton opened in 1908. 25 passenger trains a day passed through Brantford in 1901. In 1902 the cornerstone of the new public library was laid. The library opened in 1904. The first locally owned automobiles appeared in 1903. Movies started to be shown at the Theatorium in 1906. Brantford Packing Company - meat packing. Cockshutt Plow Company - farm implements. Adams Wagon Company - wagons and carts. Waterous Engine Works - steam engines, boilers, saw-mill machinery, road rollers, rock crushers, fire engines, and pulp making machinery. Mickle, Dyment & Son - lumber - lath, shingles, sash, doors, blinds, and other building supplies. Snow Drift Company - baking supplies, spices, and coffee. Massey-Harris Company - farm implements. Brantford Starch Works - culinary and laundry starches. Brant Roller Mills - flour mill. Goold, Shapley & Muir Company - wind mills, iron and wood pumps, and bee keepers’ supplies. Slingsby Manufacturing Company - bed and horse blankets, flannel sheetings, and yarns. Dean Braund's Ardency Corporation operates out this mill building today on Grand River Ave.
Schultz Brothers Company - construction, box-making, and washing machines. Mathew K. Hallaron and H.B. Gardner - cigars. J.S. Hamilton & Company and Pelee Island Wine and Vineyards Company - wine. Brantford Box Company - cigar boxes and paper boxes. Canada Cycle and Motor Company (CCM) - bicycles. Scarfe & Company - varnishes and shellacs. Turnbull, Howard & Company - hardware. Located on the corner of King and Colborne Streets, the current location of The Crawford Collective. Fleming’s Restaurant - the present location of Brant Stereo on Market Street.